Invented nearly one hundred fifty years ago, the 12 gauge shotgun has become one of the best, most effective firearms in the world. Great for hunting, sport shooting, self defense, military use, and law enforcement service, the 12 gauge is one of the most versatile short range firearms on the market. When you want high quality ammunition Winchester is the company to turn to. With their incredible manufacturing and wonderful reputation, you can't go wrong with, Winchester. 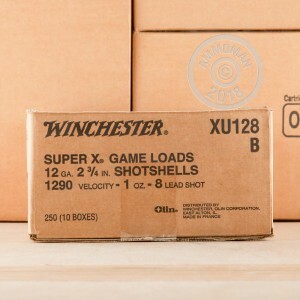 These Super-X Game Load shells measure 2-3/4" in length and carry a one ounce payload of #8 shot. 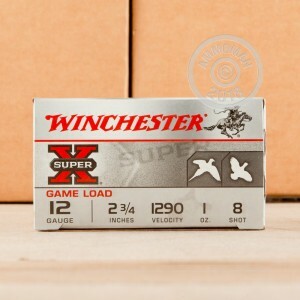 Winchester Super-X shells feature some of the best components this company has to offer including one pieced hinged wads for tight patterns and famous 209 primers for reliable ignition. 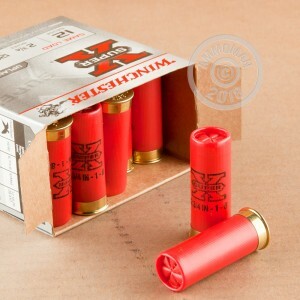 These rounds are perfect for taking down delicious small game, pick up this 250 round case today!